A loan of $575 helped to buy wood and chisels and to pay to repair the compressor. Elvia is 50 years old and lives in San Antonio de Ibarra. This parish is in the city of Ibarra and is characterized by art and culture. This is where wooden handcrafts are produced. Its economy is based on this service and it is very well known at the national level. Elvia has had a handcrafts business for 4 years. She sells her products at fairs or by orders. This work is the only income she has to support her family. Her husband also helps with the business. In general he does the sanding and lacquering part while Elvia specializes in doing the finish work for the product. At the moment she needs a loan to buy wood and chisels and to pay to repair the compressor. Your help is very important for Elvia's business to continue growing. Translated from Spanish by Kiva volunteer Karen Monat. View original language description. Elvia tiene 50 años y vive en San Antonio de Ibarra, esta parroquia perteneciente a la ciudad de Ibarra, se caracteriza por el arte y la cultura. Es aquí donde se producen artesanías en madera, su economía se basa en este servicio y es muy reconocida a nivel nacional. 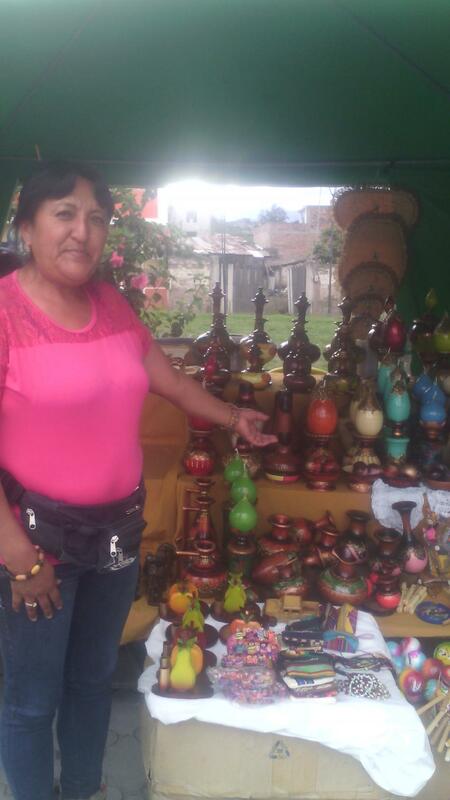 Elvia tiene un negocio de artesanías hace 4 años, ella vende sus productos sea en ferias o por pedidos. Este trabajo es el único ingreso con el que cuenta para mantener a su familia. Su esposo también le ayuda en el negocio, el por lo general realiza la parte del desvste,lijado o lacado mientras Elvia se especializa en realizar el acabado del producto. Al momento necesita un cerdito para comprar madera, gubias y pagar la reparación del compresor. Su ayuda es muy importante para que el negocio de Elvia siga creciendo. It focuses on the poorest one-fifth of the population with no access to financial services. CACMU is a savings and loan cooperative founded in 2001 in Ecuador with the goal of providing financial and non-financial services to underserved women and their families. CACMU provides a package of services throughout the business cycle, including health coverage, technical assistance and training services for environmental conservation. CACMU reaches very rural borrowers due to the creation of a mobile branch, which allows them to access remote areas where it would be too costly to open a branch. Kiva supports CACMU’s work to create sustainable financial and social opportunity for women. Kiva financing will allow CACMU to reach more rural, underserved areas while also lowering interest rates.